How did we get this book: We both got copies from the publisher. Why did we read this book: We are huge fans of N.K. Jemisin’s and wanted this book from the second we learned of its existence. Ana: You might not remember this but Jemisin’s debut novel The Hundred Thousand Kingdoms knocked my socks off so completely I became an insta-fan. Thus, it was a non-brainer that I would be reading her new Dreamblood Duology especially considering its Ancient Egypt-inspired setting (hey, growing up I wanted to be an Egyptologist). 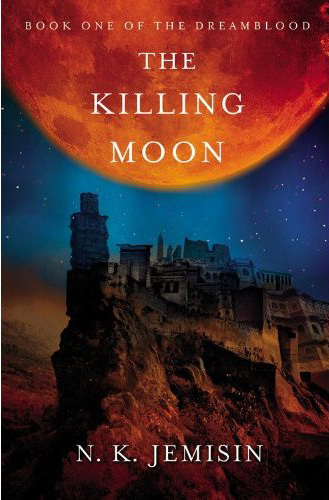 And HOLY MOLY, for its beautifully realised setting, its complex characters, its brilliantly developed story, The Killing Moon is made of 100% Awesome so excuse me if I gush my way through this review. Thea: WHAT ANA SAID! I read and thoroughly enjoyed The Hundred Thousand Kingdoms, though admittedly I wasn’t *quite* as enamored as Ana and the rest of the blogging world. Still, I love N.K. Jemisin’s writing style and was eager to read her new work, and both Ana and I were counting down the days to the release of the Dreamblood duology. And wouldn’t you know it? THIS BOOK IS AMAZING. Seriously. Amazing. In my humble opinion, it is light-years better than The Hundred Thousand Kingdoms and already has cemented a spot on my top 10 books of 2012 list. Yep, it’s THAT good. I can’t get over how utterly fascinating the world created by Jemisin is. Inspired by Ancient Egypt but completely different, this is not our Earth but a different world altogether where two moons rise in the sky every night – the Waking Moon and the Dreaming Moon. A world where the daughter Goddess of the former is worshipped by the citizens of Gujaareh, a grand city-state where peace is the law. To uphold it, priests and priestesses of the great temple harvest the dreams of its inhabitants and use that magic to heal, soothe and guide the Good Ones into the dream-life but also to kill the corrupt. The story itself follows three main characters (more on those later) – all of them sharing the narrative – as they get caught up in a conspiracy to take control over the city. As the story slowly unfolds, the level of corruption within Gujaareh is shown to be rooted in all of its corners. Gripping. Fascinating. Cool. All these mighty fine words that can be used to describe The Killing Moon. From lavish descriptions of Gujaareh and its temples and palaces to the detailed aspects of the social, political and religious structures, all of them intrinsically connected around the worship of the Goddess of Dreams, all is superbly well done. Although at points I did think there was a certain excess of exposition, I can’t deny that I gobbled it all up with pleasure. Although it is clear from early on who is behind the conspiracy that, I feel, is not the point of the story – the point is not only the HOW and the WHY but also the ways that said conspiracy and its motivation impact or will impact in the Modus Vivendi of not only the Gujaareh people but also of other peoples. Beyond that, even despite the originality of the setting, the idea behind the magic system being rooted in dream theory and the Dream-world as a PLACE reminded me a lot of Gaiman’s Sandman (not to mention that I thought of the Corinthian as well when the Reaper starts to make an appearance ) and this is a very positive thing in my book. Also and I don’t think I can emphasise enough the level of coolness present in The Killing Moon but: NINJA PRIESTS. Yeah, baby. So yeah: Gripping. Fascinating. Cool. But I have yet another favourite word to use and that is: thought-provoking. Because beyond the setting, the characters and the plot, there is the belief system that is connected with the dream world, a belief system that is also kind of a medical system which is – at least in theory – available to all. But is it? That’s when corruption comes into place – not only corruption in terms of ambition and power but also corruption of the very ideals that should support this system. One of the most interesting things about the book is the belief that the corruption of the soul is different from corruptions of actions. This means that even a monstrous act can be constructed as something good depending on the meaning behind it – like for example ultimate Good or Peace. Of course who can possibly judge what constitutes ultimate good for all? I watched it all unfold with a mix of fascination and abject horror. Thea: Yes, yes, everything Ana said. I, too, love the fascinating world that Ms. Jemisin has created with The Killing Moon and am in awe at the depth and scope of its complexity. The setting of this duology comprises different cultures and peoples – of which the Gujaareh is just one subset, juxtaposed against different belief systems, hierarchies, and people. The story centers around the powerful city of Gujaareh, the City of Dreams or Hananja’s city, with its dedication to peace above all else. Named for and honoring their Goddess Hananja, daughter of the Sun and Dreaming Moon, the Gujaareen value stability and use their magics derived from the four dream-humors to achieve this peace. Enforced by the crown Prince and the forboding religious body of the Hetawa, none are more feared or revered in Gujaareh than the Gatherers – magic-wielding warrior (ok, NINJA) priests that have the ability to harvest ‘dreamblood’ (the most potent of the four dream-humors), sending souls free of their earthly husks and into the world of eternal peace of dreams. Clearly, this is a complex world! What is so impressive about Gujaareh (and the other peoples we see in this book, particularly those of Kisua) is in its utterly fantastic holistic believability. We believe in this world and its characters because the culture is so well defined, the rules of magic so wholly conceived, the tensions between classes, between natives and foreigners, so utterly genuine. Reading a society like that of the Gujaareen makes it so glaringly apparent how lacking so many contemporary fantasy novels are in comparison – N.K. Jemisin’s worldbuilding is of the highest grade, and nigh unparalleled. Add to this the wonder of a society that is not based on a Western (or Eastern) European pantheon! Add to this, the gorgeously intricate, wholly imaginative system that uses ancient Egypt as a base of inspiration – and I don’t mean gilded pharaohs and pyramids and whatever cliched visions we might have of Egypt. I’m talking Goddess of the afterlife, priests with great and terrible powers, the concept of soul (ba, ka, and all other elements), and more. I also love that this world is one of people of color – for the Kisuati protagonist Sunandi, dark skin is a demarcation of class – those with lighter skin have bloodlines ‘tainted’ by outsiders – and this inversion is both eye-opening and food for thought in a genre that is so overwhelmingly populated by white heroes and heroines. There are so many other complexities that I could wax on about, too – the treatment of women (the interesting tension between ‘revering’ women as masters of the home, versus those Sisters of Hananja that serve the Gujaareh outside of the hierarchy of the male priesthood and Hetawa), the examination of desire in all its forms, the tension between acceptance of same-gender relationships and the denial of love. And I have barely even talked of the story proper, which is a mystery of corruption, politics, intrigue and madness on a fantastic scale. I love that the book follows three protagonists – the Gatherer (with a very interesting past) Ehiru, his devoted young apprentice Nijiri, and the Kitsuati spy/ambassador, “Voice” of the Protectorate, Sunandi. There is corruption at the heart of Gujaareh, and it binds these three lives together in unexpected ways – they must find the source of the madness, stop the Reaper before it consumes the souls of the innocent, and restore justice before war tears apart their different countries. Suffice to say, there is much going on in The Killing Moon and I. Loved. It. All. Ana: The three main characters of this story are: Ehiru, a powerful Gatherer who is completely devoted to his beliefs but on the brink of becoming the thing he fears and despises the most – a corrupted Reaper; Nijiri, Ehiru’s young Gatherer apprentice, completely dedicated to his master, willing to do anything to keep him safe; and Sunandi, a diplomat (and spy) from another state, ready to unveil the truth of Gujaareh’s corruption to the world. It is through their point of view that we see and hear Gujareeh and its intricacies. It is in their characters’ arc that all the complexity of this world is explored and played out. All of them one way or another are faced with truths, challenges and have to make decisions or revise their opinions. In them, Jemisin explores brilliantly the very idea of an ever-evolving world in terms of its ideals and beliefs. These are compelling, complex characters that develop relationships with each other that are equally complex in ways that are not simply woven. Ehiru and Nijiri’s relationship is a beautifully rendered relationship between Master and Disciple but also one that has difficult aspects connected to it as Nijiri is in love with his master. Ehiru’s reliance on that love – despite not reciprocating it in the same way – is not only understandable given the circumstances but also somewhat despicable. That I can feel sympathy for these characters even as they commit acts I absolutely abhorred – Ehiru and Nijiri are after all, killers in the name of peace, mercy and love – is part of what I loved about this book. Sunandi on the other hand, provides that outsider look whose take is a bit different from those and who doesn’t pull any punches. Her own beliefs dictate her distaste for what Ehiru and Nijiri do and at points I felt she was MY voice. I loved Sunandi and she was probably my favourite character all things considered. Although I will admit a soft spot for Nijiri. Thea: Again, what Ana said! The trio of protagonists each offer a different counterpoint and perspective, not only in terms of narration but in terms of belief. Because I am a sucker for a strong, conflicted and flawed heroine, Sunandi is my favorite character of the three. I love that Sunandi is the outsider of this piece, a non Gujareen, and brings an entirely new set of eyes to the customs, traditions, and beliefs enacted by her hosts. She questions and abhors the practice of Gathering, for example, which through the eyes of Ehiru and Nijiri are beautiful, essential rites that free the ailing, bring justice to the corrupt, and power their beloved city. That’s not to say the Sunandi is a perfect character, because she certainly has her own sizable flaws. Judgmental to a fault, in one scene Sunandi immediately writes off her hosts because she perceives that they treat servants as slaves (when clearly they deserve basic courtesy and acknowledgement) – but in the next breath, she criticizes the skin tone of the Gujareen Prince, who is too light-skinned to be of untainted lineage. Also, Ehiru and Nijiri are wonderful characters in their own right, with their own struggles and foibles. Ehiru mourns a failed gathering and the discover of corruption in his beloved city amongst the ranks of the Hetawa, while Nijiri struggles with his own deep burning love for his mentor and friend. These struggles, compiled with the larger storyline and conflict, are wonderfully wrought, and I felt deeply for all of these characters. Ana: Quite possibly one of the best Fantasy novels I’ve read of late and definitely a top 10 read of 2012. I also really need The Shadowed Sun now. Thea: Agreed. I loved this novel deeply, and I cannot wait for The Shadowed Sun. The Killing Moon, to put it simply, is the best book I have read in 2012 thus far. You can read the first chapter in full – along with other sample chapters – on N.K. Jemisin’s website HERE. Additional Thoughts: The lovely N.K. Jemisin is our guest today, talking about the Dreamblood Duology in an excellent post on the Unexotic Exotic. We highly recommend you check it out. Wow. I want this book bad. I just brought purchased some books from amazon the other day and I had this in my cart but I took it out. I will not make that mistake again. Thanks ladies. Not reading this. Not reading this. Not until I read the book firsts. And since I’m two books behind, I guess it won’t be for a while. With this one turning up on my Kindle, I knew I had to work on getting caught up, so I started “The Broken Kingdoms” today and I’m loving it so far. So I have skipped to your ratings and I’m delighted to see you both loved it. I’ll get to it eventually. Sounds wonderful. Can’t way to pick up a copy! Glad to hear you guys liked this – I’ve reviewed it for (the next issue of) SFX, and thought it was a significant step up from her first trilogy.